Bollywood super star 'Salman Khan' is looking for business as well as other celebrities . Salman Khan has invested in the online travel portal 'Yatra.com' and will also be the face of its new marketing campaign in India and the US. The Salman Khan's NGO, "Being Human", also will benefit from this association. Because some amount will be transfered to 'Being Human' when transaction occurs in that Portal.The company will also sell "Being Human" products on its website, the sale of which, again, will be contributed to the NGO. "I am really excited about my association with Yatra.com. This is not a normal brand association, where I am there just for face value. 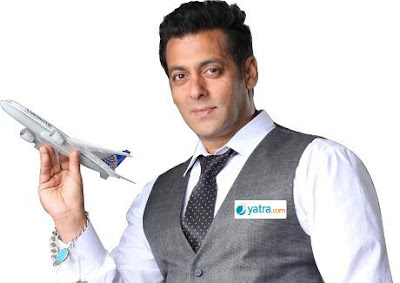 With Yatra, I am also now a shareholder," said Salman khan. "I have immense confidence on the brand and am hopeful that the association will be beneficial for the both of us," he added. "We have always wanted expand to newer mass markets and associating with Salman would enable us to do the same," said Dhruv Shringi, CEO and co-founder of Yatra.com. Now a days, Most of Bollywood celebrities invest their money in some business ..
Like Shah Rukh Khan , Shilpa Shetty ,Preity Zinta in IPL(Indian Premier League).